OMG. You guys, the sales and the Christmas and the fervor!!! HUGE month for my wardrobe, a mixture of purchases and gifts. True Lady Dress in Citron at Lizard Thicket, plus two belts ($40 + $23): Lizard Thicket is kind of my favorite boutique here locally. I needed something to wear to my high school reunion (note: I waited until 48 hours before the reunion to think about what to wear) so I splurged on this dress and two belts. I guess it's a special occasion, right? Plus I know I can wear the dress for other things. It's fully lined and I love it! kate spade Cobble Hill Small Leslie in Chocolate (originally $378, paid $169): Guys, I can never resist kate spade's Surprise Sale. For real. Up to 75% off the shiny, pretty things. Ugh. But I did list some more of my other handbags for sale on Poshmark (check them out, they're designer!) to cull the collection to make room for the new. This leather bag is just BEAUTIFUL, and I needed a brown one that was functional with that cross-body strap. ny collection lace cardi & Charter Club open cardi (FREE from Mom's Closet): I tried on a lace cardi at LOFT that my Mom was shocked I liked. She said she had one at home she found on sale at Macy's three years ago and never wore! She had another open navy cardi that she gave me once that I never wore because of the length, so she got this one NWT and handed it down to me too. Score! Columbia Fleece Jacket (originally $50, FREE in Trade): I have a North Face jacket that I rarely wear because I didn't size it up to wear with sweaters underneath. Boo. But Mom is smaller than me and loves to hike, so she's had her eye on my jacket for a while. I told her I needed a replacement. We were at the Columbia outlet on Black Friday and I loved this jacket. I had a sweater on and so I was able to choose the right size for layering. It was on sale for $40 plus an additional 25% off. I think we both are winners in this trade! 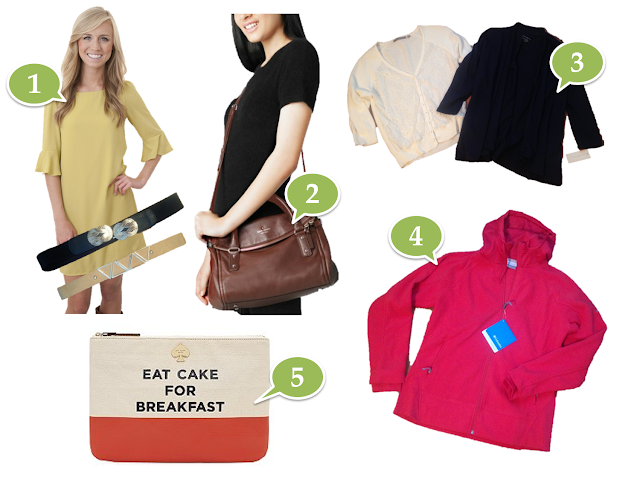 kate spade Eat Cake for Breakfast Pouch Adrianne (originally $100, paid $35 on Poshmark): I haven't loved anything I've bought on Poshmark before, but this little bag spoke to me. I had some Poshmark credits so it really knocked down the price and made it worth a try. I wanted it to carry my iPad mini and accessories for when I travel or toss it into a big purse. I love the "Eat Cake for Breakfast" message, cheeky enough for a smaller bag but not something I'd carry as a full novelty purse. Elizabeth & Clarke Davis Top ($20): I received my 2nd Elizabeth & Clarke box this season, but the only one of the three shirts I selected that I loved was the Davis. Burberry Gauze Giant Check Scarf (gift from friend): This beautiful, timeless, classic scarf was a surprise gift from a very generous friend. It will be a wardrobe staple for me for sure! My neck feels so glam. Merona Peter Pan Studded Collar Cardigan in navy (originally $25, paid $15): Impulse purchase while Christmas shopping, I wanted the oatmeal but they were out of my size. I loved the navy though, and I think I might actually wear it more! I got an even better discount with my Target RedCard. Everlane Weekender Bag (gift from parents): This is a great bag that holds a TON! It even has little metal feet on the bottom. Yea, so at the beginning of the month I admittedly was like EFF THE BUDGET and was a big fat failure. The sales around Christmas shopping season are just so irresistible. But I was also spoiled rotten with gifts, as per usual, so I got even more bang for my relative buck, right? I can live with $38 over considering everything I hauled. Even though I wasn't on track this month AT ALL, I do love that I have half a year's worth of documented spends, so I now know that I need to reserve my 4th quarter budget for the holiday sales. Overall, I was only $5 over for my 6 months' budget! Woohoo! 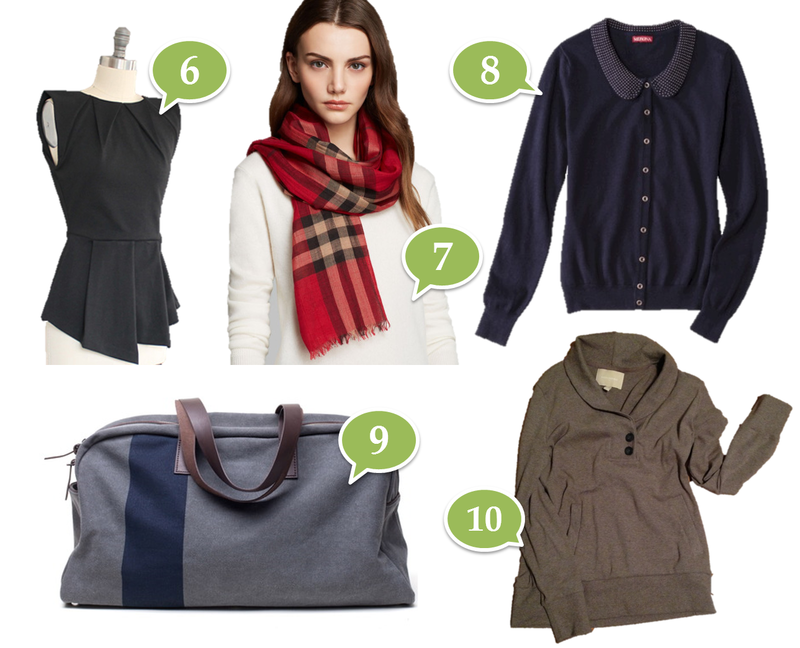 Check out the rest of the Budgeting Bloggers' December hauls at Franish! I'm making January my first month for budgeting bloggers. I would go for quarterly, but I bet I would spend it all the first month and not have anything again for a long time. Haha, we'll see how it goes with the switch! I might end up the same way... though in general what I am trying to do is stick close to $150 per month still as a guideline unless I buy an investment piece. This has actually really cut down my spending in general, as well as forced me to only keep things I'll actually wear again and again! Let's just say Mom and I scored big at the outlet mall on Black Friday. LOL! I would estimate most if the items were 50-60% off retail! :) I lost 13 pounds so I needed new work-appropriate tops, and the parents definitely delivered. The Everlane bag was a surprise; it was on my wish list, but my parents rarely order anything online. You got some amazing things this month! I love that you traded that jacket to your mom - such a good idea. Also, that everlane bag is soooo pretty! I might add that to my wishlist :) And yay for being so close to your 6 month budget! Adorable kate spade bag! I never find much on poshmark either but that is an awesome find! I've been thinking about getting the everlane weekender - with your glowing review I might just have to go for it!